That was then… Ruark Solstice review | What Hi-Fi? Regular readers will know that we have something of a soft spot for Ruark’s MR1 powered speakers. These compact wireless boxes deliver a surprisingly musical sound while packing in all the features needed in a £330 stereo desktop package. They also stand out in a crowded market by delivering a classy retro appearance without appearing dated at all. It’s a neat trick that few can better. Those familiar with the MR1s may not know that Ruark’s foundation is based on traditional high-quality stereo speakers. You’d have to go back a couple of decades to find the company at its peak with such products, though. At their best, Ruark speakers not only sounded good, but also were finished to a standard few in the industry could match. We have fond memories of the Talisman and Crusader floorstanders of the early ’90s in particular. While the company was known for its high-quality middle-market products, it wasn’t afraid to aim high. In late 1998 we reviewed one of the company’s most ambitious models, the mighty Solstice. We’ve revisited the speakers and the original review here. These 114cm tall towers took everything the company had learnt at the time and wrapped it in a sophisticated two-box configuration that split the bass section physically from the enclosure housing the 75mm midrange dome and 19mm tweeter. The two sections are connected by a short umbilical and physically separated by elastic polymer feet designed to isolate the higher-frequency drivers from any bass-induced vibrations. The top part has the triwire terminals and a pair of toggle switches to alter the midrange and treble output. The adjustments are fairly subtle, altering the respective levels by a few dB. 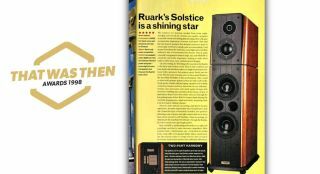 Almost two decades on from that original review we thought it would be interesting to see how the Solstice stacked-up. Ruark still has working samples in its listening room and was kind enough to supply a pair. Once these speakers are out of the packaging it’s the quality of workmanship that impresses us first. The cabinets feel more like quality furniture than a piece of hi-fi. The finish remains impeccable, from the application of the luxurious wood veneer and smart paint finish to the crisp engraving of the multitude of small metal plaques that adorn the boxes. The two sections for each channel are easy to assemble but watch out for the weight of the top part – it’s heavier than you might guess. To make things easier it’s worth finding your optimum position before fitting the chunky spikes. We ended up with the towers about a metre into the room and well away from any sidewalls. As our original review states, they’re pretty unfussy for high-end speakers and can be placed closer if you need to do so. The Solstices are pretty easy to drive, too. Their sensitivity is high at 89dB/W/m and the nominal impedance is 8 ohms. These figures suggest that the quality of the partnering amplifier is going to be far more important than its muscularity. We connect the Solstice to our current reference set-up of Naim NDS/555PS streamer and Gamut D3i/D200i pre/power and leave them to shake off the cobwebs. It doesn’t take long to realise that these remain fine speakers. Judged by current standards they’re not flawless but it’s equally obvious they still get all the basics right. Their combination of agile dynamics, authoritative presentation and expressive midrange impresses as much today as it did back in 1998. These speakers have no difficulty in getting out of the way and concentrating the listener’s attention on the music being played. They work well at lower volume levels too – an area where many modern speakers are weak thanks to the requirement for higher listening levels. Once properly warmed, these Ruarks sound solid, lively and responsive, working well across a wide range of music. They can thump out Kendrick Lamar’s King Kunta without tempering the music’s aggressive attitude yet render Arvo Pärt’s Tabula Rasa with all the refinement and subtlety it deserves. Stereo imaging is reasonably precise and the soundstage is nicely projected. Most of all, these speakers remain enjoyable to listen to. They kept us coming back for more, even after we had to move onto other products. Things have moved on in certain areas though. Current high-end speakers have more in the way of detail resolution and tend to sound crisper and cleaner. Comparably sized PMCs, ATCs and ProAcs render larger-scale dynamics with greater force and deliver bass lines in a more assertive way. But that’s to be expected given the engineering gains made in drive units and cabinet design over the years. We find it interesting that we can hear something of the Solstices’ character in the little MR1s. They both sound enthusiastic, fluid and appealingly musical. The two share similar tonal characteristics too. Despite Ruark not making high-end speakers such as the Solstice anymore, we’re pleased the company’s DNA remains intact.